David R. Godine, 2006. 255 pages. Kit Bakke begins, "I was home alone, that rare treat for the working mother, when it occurred to me to write to her. To Louisa May Alcott. Why not?" She goes on to explain why writing to Louisa resonated with her life. And apparently she pulled it off! I wish I could explain more about the mechanics of our correspondence, but I can't, because, other than frying six surge protectors, I don't know how it worked. I sent my letters and chapter drafts to Louisa by e-mail from my Seattle living room, and she received them as handwritten ink on paper in her roms in Dr. Lawrence's house in Roxbury, Massachusetts. She once told me my handwriting was neat and extremely legible, so there was definitely something odd going on. She wrote to me, using well-worn ink pens and paper, and they showed up in Times New Roman in my Outlook inbox. I was grateful for the technology transfer, as her own handwriting was also less than copperplate. It's one of those Internet Effects, I guess. Or a Heisenberg thing, or Brownian motion gone amok. I didn't want to inquire too closely for fear the magic might vanish. What follows is a series of essays about Louisa May Alcott's life and the parallels with Kit Bakke's life in modern America, framed by letters (no, e-mails) purporting to be from Louisa herself. I loved the idea of this book, because when I was a girl in 6th or 7th grade, I actually spent quite a bit of time daydreaming about bringing Louisa May Alcott into the present to show her all the advances women have made. I don't think any other author ever prompted such a reaction, but I distinctly remember thinking out what I would say to Louisa May Alcott if I could pull this off and meet her. So imagine my delight, more than thirty years later, to learn that Kit Bakke in some sense managed to do what I daydreamed about as a child. I think it was Louisa's zeal for "reforms of all kinds" that prompts this sort of reaction from her readers. We want her to know about the progress that was made, and about the good that came from her own efforts. Kit Bakke did some work at reforms of her own in the sixties, so she tied those stories in with her thoughts about Louisa's life. This book is a fascinating blend of musings on life in modern America combined with historical information about Louisa May Alcott and her times, as well as the personal touch from imagining Louisa's reactions. This book will be most enjoyed by people who have read and loved Louisa May Alcott's books, but there are millions such people out there. For myself, I want to find a copy of some of her less-known books for adults mentioned, such as Work. I will be able to read it with new appreciation into the background and what it meant in Louisa's life and times. 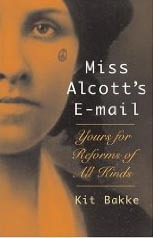 Reading Miss Alcott's E-mail reminded me of an author I loved in my childhood, and told me more about her work for adults, which I have yet to discover.